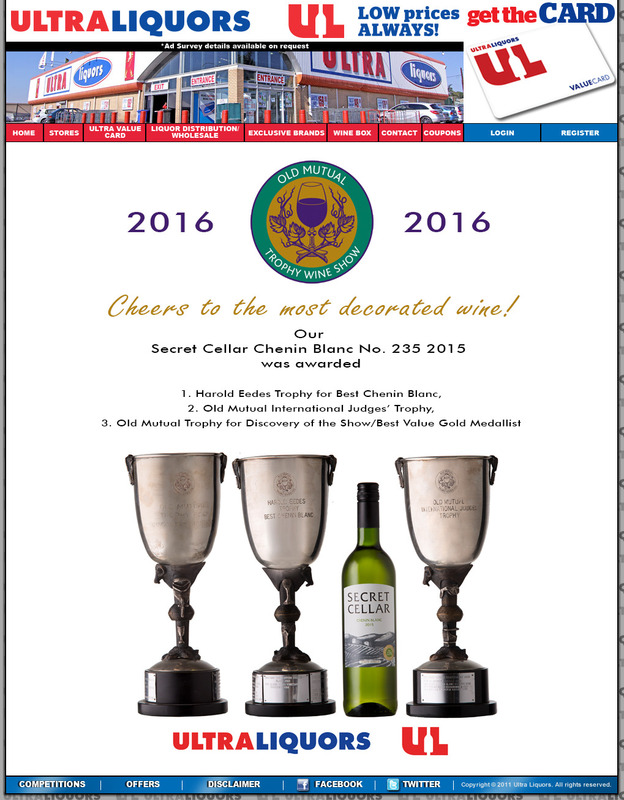 Recalling my innocent consumer era thrill of a fine wine at a bargain price I dashed off to buy multiple Old Mutual Trophy Wine Show winner Secret Cellar Chenin Blanc 2015 Selection No 235 for a mere R32.99 from Ultra Liquors - Secret Cellar is their buyer’s own brand or BOB as it is known in the trade. In this case Bob is Mark Norrish and the wine garnered no less than three trophies including International Judges’ trophy (highest scoring trophy on the international judges’ ballots). I first asked Ultra liquors on Twitter about price and where the wine was available and their reply (since deleted) referred to the price and that it was limited to three per customer without mentioning which branches had stock. Goodwood branch is the nearest to Stellenbosch, which is where I managed to buy what I assumed was the award winning wine. 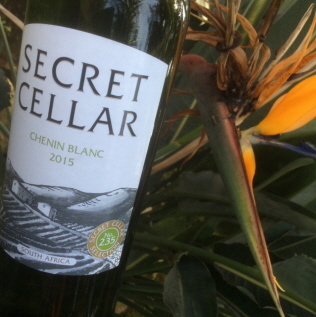 ‘The Secret Cellar Chenin Blanc 2015 has 2 bottlings so far. Both of these bottlings have been from the same tank which was SAWIS approved. The first bottling certification number on the seal starts with 7525. The second bottling, which is the winning OMTWS wine, has the seal number starting with 7660. We are currently not sure what which bottling each of our 16 stores that have in stock. There is a strong possibility that they could be mixed between the above mentioned seal numbers. Both bottlings are under the same Selection number which is Selection ‘235’. Just to mention we are not putting any of the stickers on the winning Chenin as we are sure that most, if not all stock will be sold out by the time we receive the stickers. The wine will be on show at the CTICC this evening. Rather miffed that I had the ‘wrong’, rather ordinary wine, I set off, on 3 June, to their Green Point branch where I found many incoming cases of batch 7525, none of 7660, with floor staff insisting it was the Trophy winner and that I could only buy three bottles. Off I headed to the Wynberg branch, where I was confronted by an empty shelf with a temporary sign again regarding the three per customer limit for the trophy wine. My first request for the wine produced bottles of 7525, but my second request for 7660 to a more senior staff member yielded three bottles from their backroom storage. That night when comparing them side by side, it was apparent that they were very different wines – yet being retailed as the same award-winning wine – so on Monday 6 June I had them analysed by the Cape’s leading wine lab which yielded some interesting results - 7525 has a residual sugar (RS) of 1,71 g/l while 7660, the trophy wine, has 4,53 g/l of RS. Other marked difference included extract of 20,73g/l v 24.05g/l and hue (420nm) of 0,06au v 0,10au – no question these are different wines yet Ultra Liquors is clearly retailing them at multiple stores as the same award winning wine. Any other Seal number is not the Trophy winning wine. Due to limited stock, only 3 bottles per customer. ‘The day after the Award announcements, we checked our stock holding of the total Chenin stock in Stores and our Depot. I must mention that the Trophy wine stickers had not been received at that time to place on the wines for correct identification purposes. Also, based on my experience of sales on a winning wine at this price, I expected all our Chenin stock to be sold out by that same weekend. There was very little stock of the 1st bottling left in Stores at the time, so I immediately allocated the new "award winning "stock to the Stores on Wednesday 1st June ( 180 x6 cases)on a 3 per Customer basis. One wonders why they didn’t add this information to their original signs limiting customers to three each? Is this a case of sloppy stock control, intentional fraud to mislead customers into buying ordinary wine or the reality of FMCG retail? Although winners can order additional bottle stickers indicating their accolades, Old Mutual Trophy Wine Show organisers print stickers in advance, in anticipation of the first batch of orders. Anybody want 3 bottles of 7525? At the time of publication the writer was awaiting Ultra Liquors permission for SAWIS to corroborate their claims that both 7525 and 7660 came from the same tank while the Green Point store apparently had stock of 7660. I have so many things to say about this but lets stay with the basics. All of us in the wine industry knows the codes and bottling batch systems - put your self in the ordinary consumer shoes, how are they supposed to know what the winning batch is. How will this be controlled at restaurants? As a producer not a "producer" I feel that if you don't make the wine yourself, blend it, bottle it then anybody from the street can enter competitions as a "wine producer". There are just too many people claiming it without growing the grapes, harvest, fermentation, blending and bottling - for me, all wanna be's or fakes!